Challenges Action: Kneel Margaery Tyrell to choose a character. Until the end of the phase, that character gets +3 STR. "I know what a burden you bear. You should let me share the load. There must be some things I could do to help you." 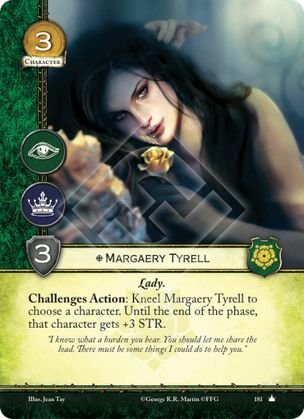 There is no limit on the number of times you can use Margaery's ability in a challenges phase (if there were, it would have to be explicitly stated, as it is on many other cards). Provided you can pay the cost, "Kneel Margaery Tyrell", you can gain the effect. So it's perfectly legal to kneel Margaery for her ability, stand her (with Magister Illyrio, Handmaiden, Seal of the Hand, etc. ), and then use her ability again.